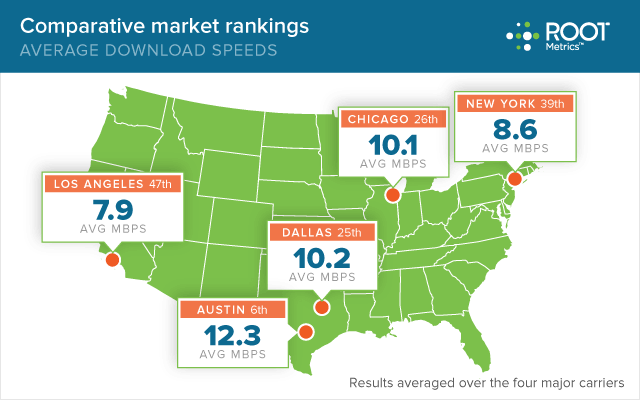 Austin is ranked sixth out of U.S. cities when it comes to mobile download speeds, based on data collected by Root Metrics, the company that provides crowdsourced cell phone coverage maps. 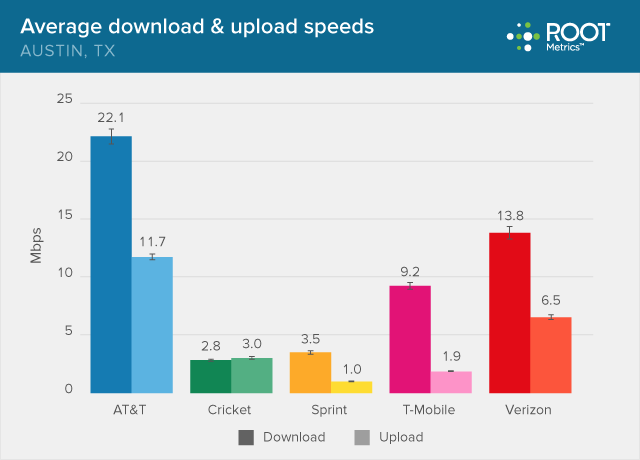 Averaged across the four national carriers Austin download speeds reach 12.3 Mbps, which is pretty zippy for the host of SXSW. Of course, with 25,000 people expected to converge on the Texas capital starting tomorrow for the interactive festival, those speeds will fall precipitously. As most people are aware, more users mean slower speeds on cellular networks, as there are only so many airwaves available for cellular transmissions and only so many bits that equipment vendors can cram in to those hertz. While Wi-Fi offload will help, as will bringing in more cell towers, the truth of the matter is the network will be stressed. Unfortunately, stressed networks also mean your battery will drain faster, so pack that extra battery. But how stressed? That’s the question GigaOM and RootMetrics wants to answer. When a tech savvy population toting the latest mobile tech hits a 4G city with good speeds, what happens? So the company is asking attendees to download its app (as a bonus once it’s downloaded you not only send information to RootMetrics about your experience, but you also get the coverage maps that can come in handy when you hit a dead zone) and tweet their service quality to @rootmetrics with the hashtag #SXSW. So grab the app on iOS(s aapl) or Android(s goog), and go out there and party like it’s SXSW. We’ll publish the results afterward, so you can see exactly what happens when cell networks meet the geek hordes. is anyone experiencing massive failure of cell and at&t cable service near houston? It’s during the music part of SXSW where things really begin to suffer, especially for all of the free shows on the “east side” (east of I-35). My guesstimate is that for Friday and Saturday of music, more than 100,000 people were near downtown for the festivities.